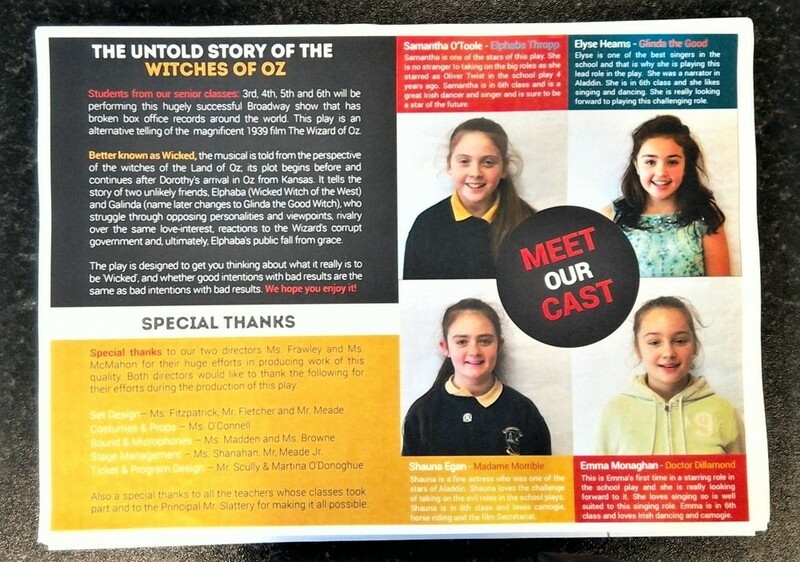 The school has just finished putting on a fantastic performance of ‘The Untold Story Of The Witches Of Oz’. The show took place last Tuesday and Wednesday and was sold out on both evenings. The large crowds were transported to the Land of Oz to see the real story behind the two witches of Oz. Who would have thought they used to be good friends? The children were absolutely fantastic and played their roles very well. Some of the singing performances were out of this world. This musical was a huge undertaking by the school. We would like to thank all our students for working so hard over the last few weeks and a huge congratulations goes to Ms. Frawley and Ms. McMahon for directing the play. It certainly was a credit to you both. 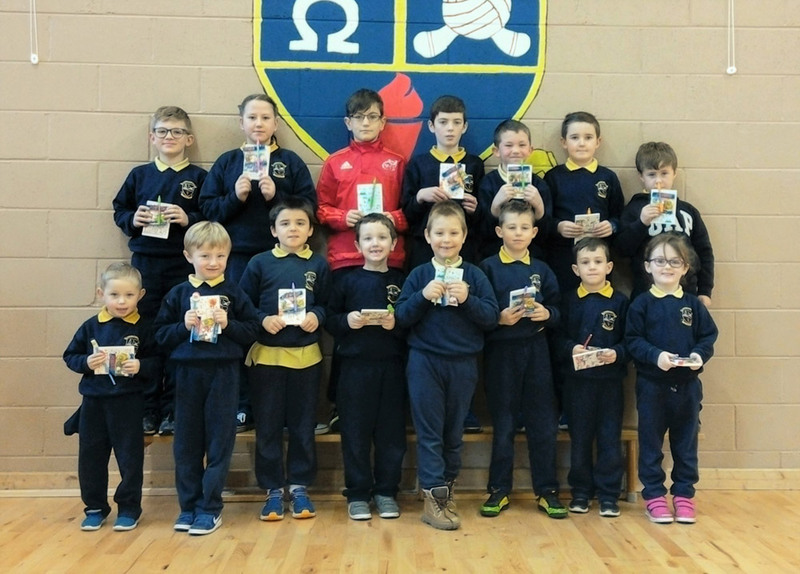 Today was the final of the 3rd/4th class ‘Fastest on the Draw’ quiz competition. We had a very close competition between The Brain Busters and The Three Teethuns. On The Brain Busters team were Ceola Bergin, Roy Egan and Karlo Pohjanen. On The Three Teethuns team were Patrick Moloney, Billy Hayes and Senan Whelan. 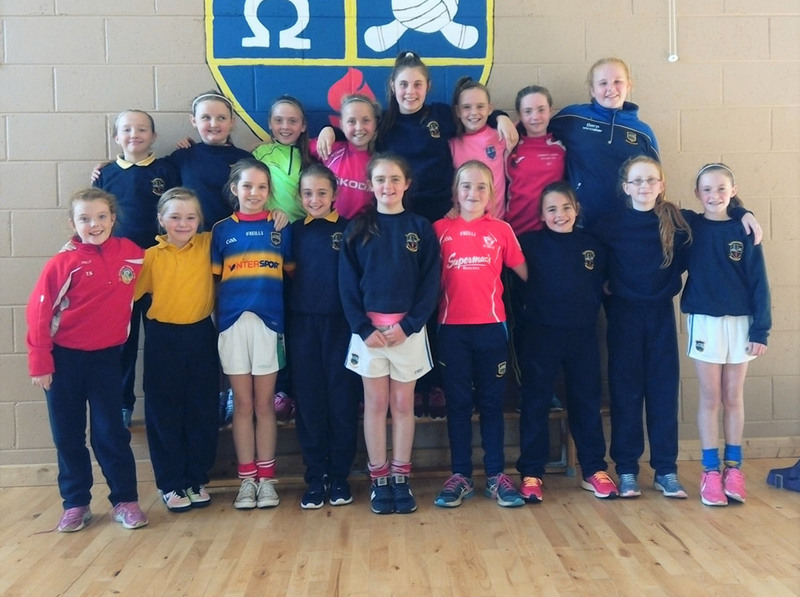 Both teams came from 4th class. It was very close throughout but in the end The Three Teethuns won. The score in the end was 30-24. Congratulations to the Three Teethuns. 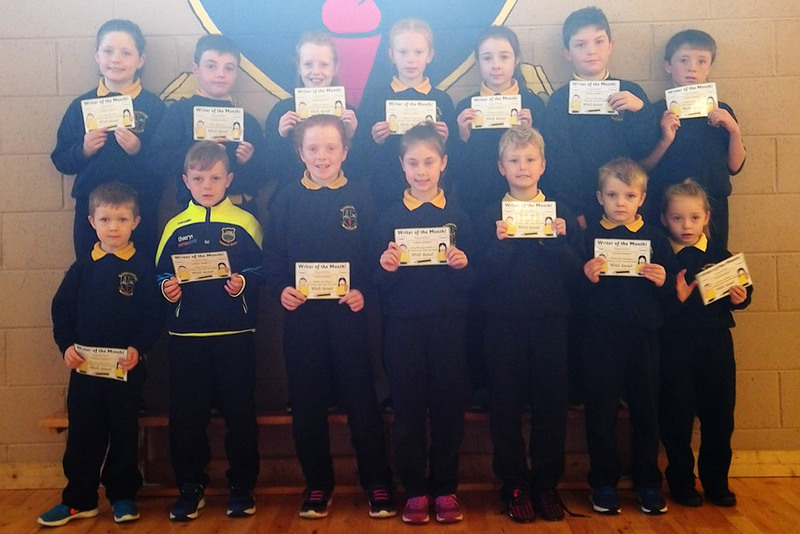 You were worthy winners in the end but things will get much harder for you all next year when you enter the 5th / 6th class competition so you better keep working on your general knowledge. 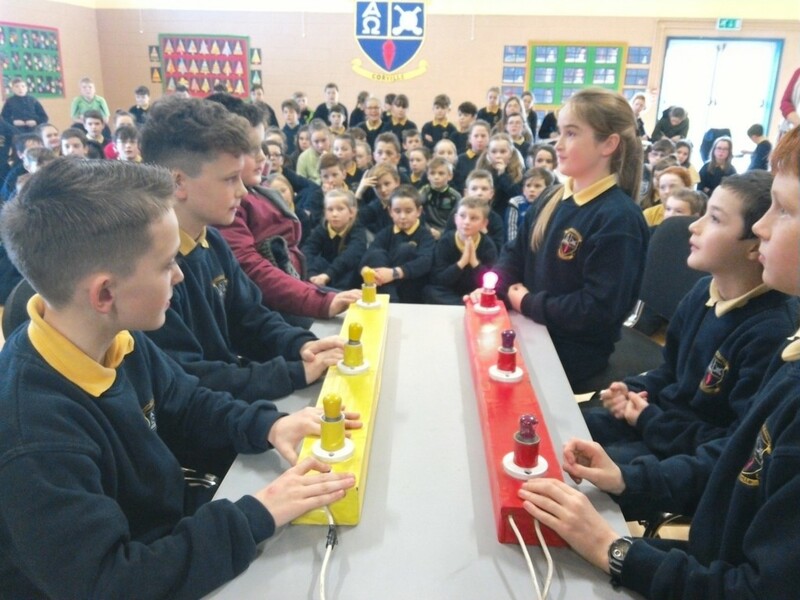 The eagerly awaited final of the 5th / 6th class quiz competition took place in school on Thursday. For the first time ever we had a team from 5th class in the final; they were the Wolfy Ceners consisting of Ryan Whelan, Nadine Simplicio and Naomi Simplicio. 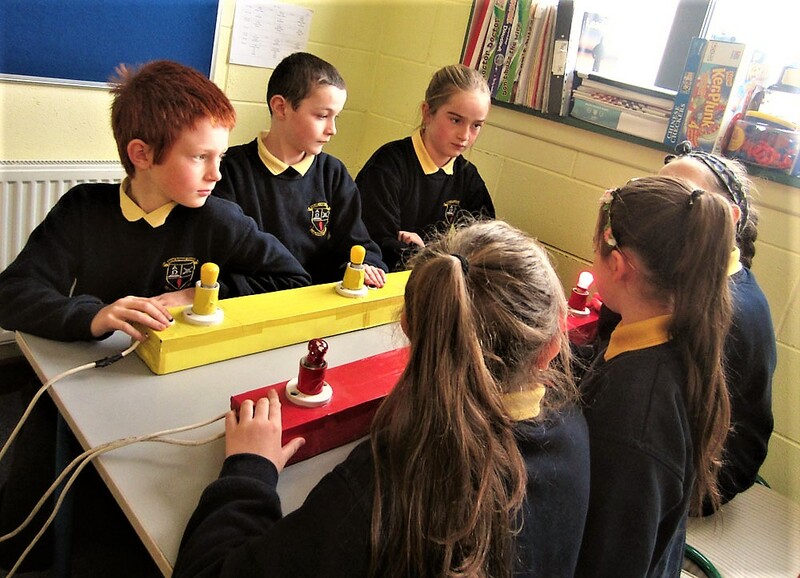 This team were the winners of the 3rd / 4th class competition from last year and were yet to be beaten in a contest on the buzzers. They were up against it today however, as the 6th class team of Keri Pohjanen, Stephanie O’Toole and Jake Morton (team name: The Skittles are Back!) went in as the favourites for the title. Wolfy Ceners received a 6 point head start in this first to 30 final. In front of a large crowd in the hall, the 6th class students soon closed the gap and pushed on ahead. 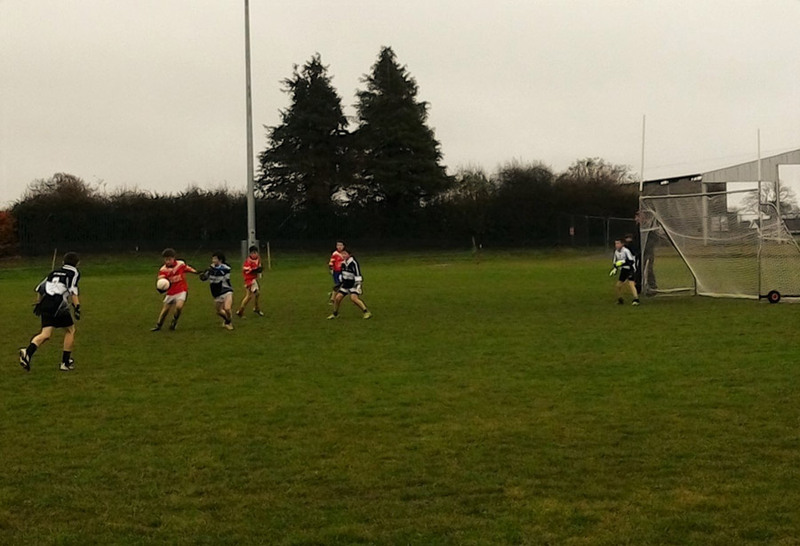 The 5th class team still put in a great fight but lost out in the end by a score of 30 – 21. Well done to the Skittles are Back! You were well deserved winners on this occasion. I am sure the Wolfy Ceners will be back better than ever next year. Here is a short video of the start of the quiz. You can get an idea of how quick you have to be on the buzzers to score. In Corville, we are busy getting ready for Christmas. 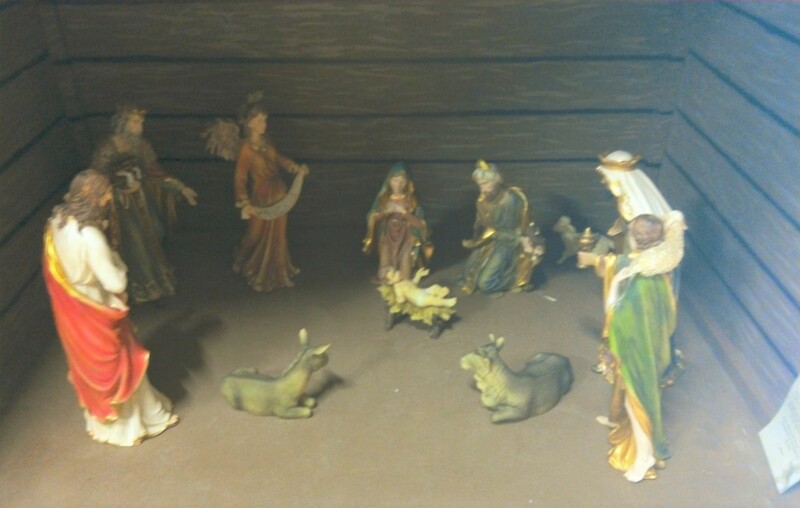 We have been painting windows and walls and putting up our nativity scene. 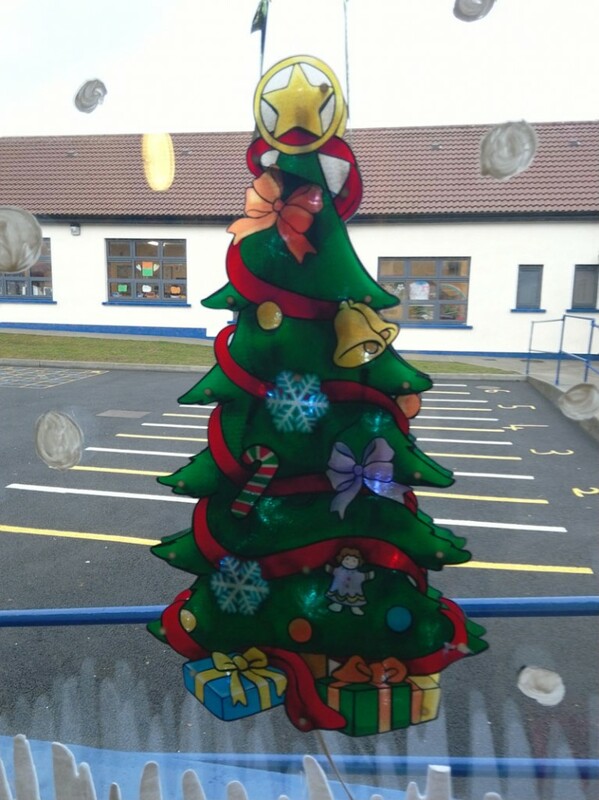 We are also putting up Christmas decorations all around the school. 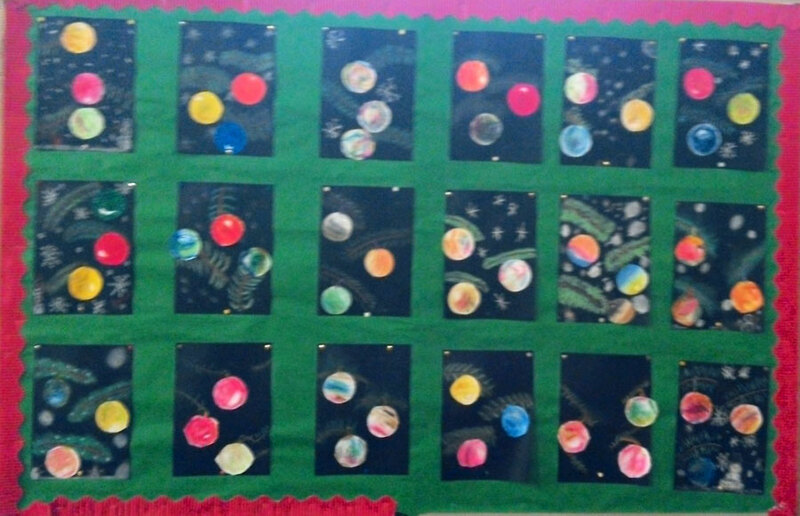 Our classes have been making Christmas art for display. 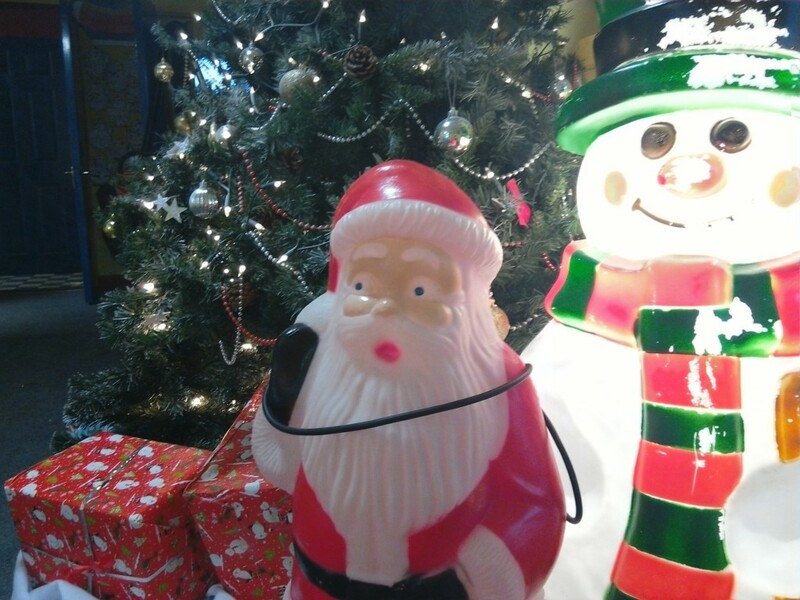 We are also doing our best to be good for Santa. Excitement is certainly building around the school! 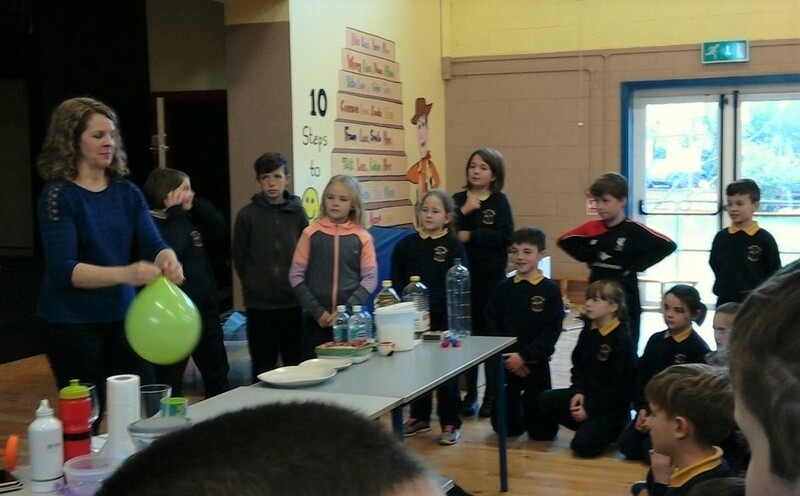 Students from Ms. Mulderrig’s 5th class are taking part in this year’s Junior Entrepreneur. Abi Vozza and Ella Brussels have come up with the Christmas themed idea of selling Magical Reindeer Food that is perfect for Rudolph and his reindeer friends. They will be selling their product at the school play on Tuesday and Wednesday evenings for €2. Take a look at the product advert they created and make sure to stock up when the sale begins! 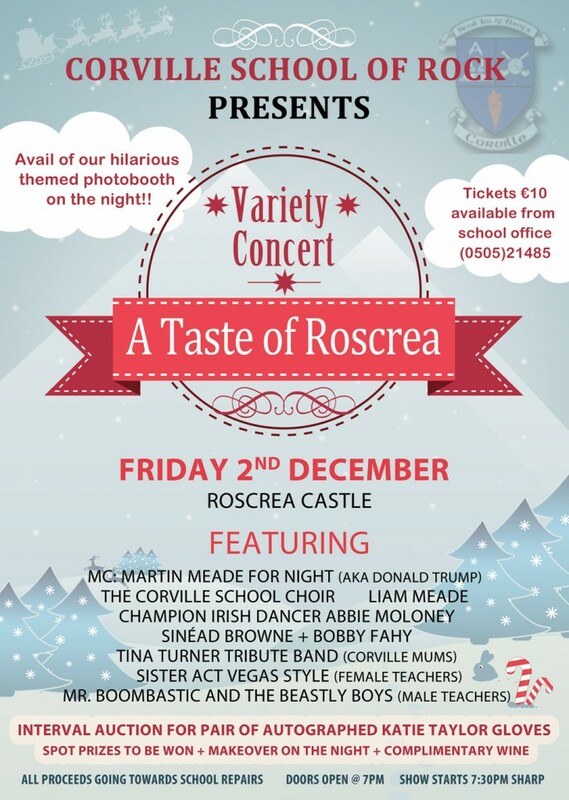 Taste of Roscrea: thanks to all the students, parents, teachers and wider community for making our Friday night variety show at the Taste of Roscrea festival so successful. 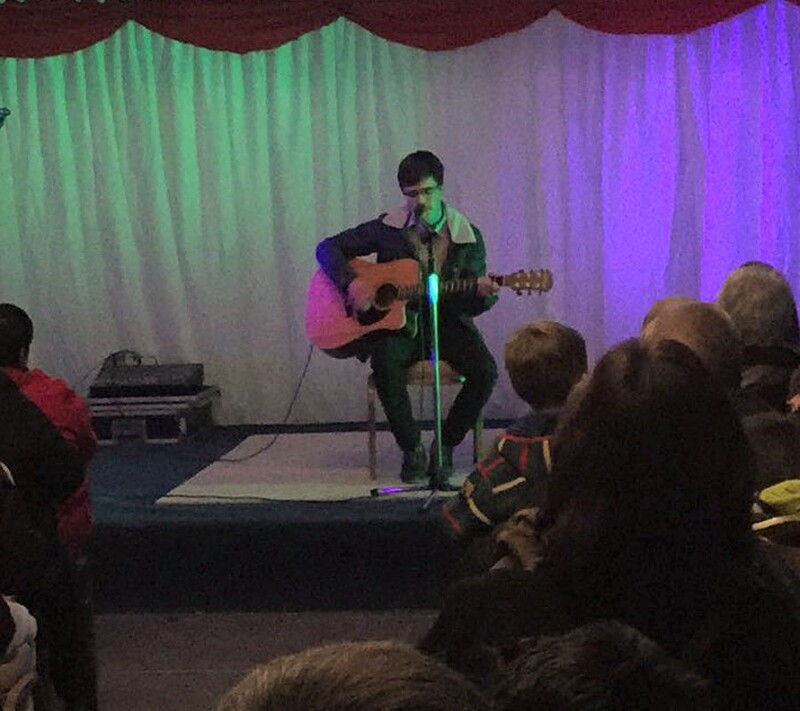 A super time was had by all and it was well worth the entry fee just to see the Lady in Red himself, Mr. Slattery, performing on stage. There were fine performances all round with Abbie Moloney getting things underway with some lovely Irish Dancing. Next up were the school choir followed by Mr. Meade junior who belted out a few hits on the guitar. The Corville mums put in a super performance as the Tina Turner tribute band. Their performance of Proud Mary went down very well with the large crowd in the marquee. Next up was the auction for the signed Katie Taylor boxing gloves. Bids were flying in and a lot of money was raised for the school from this so we thank you all for your support. 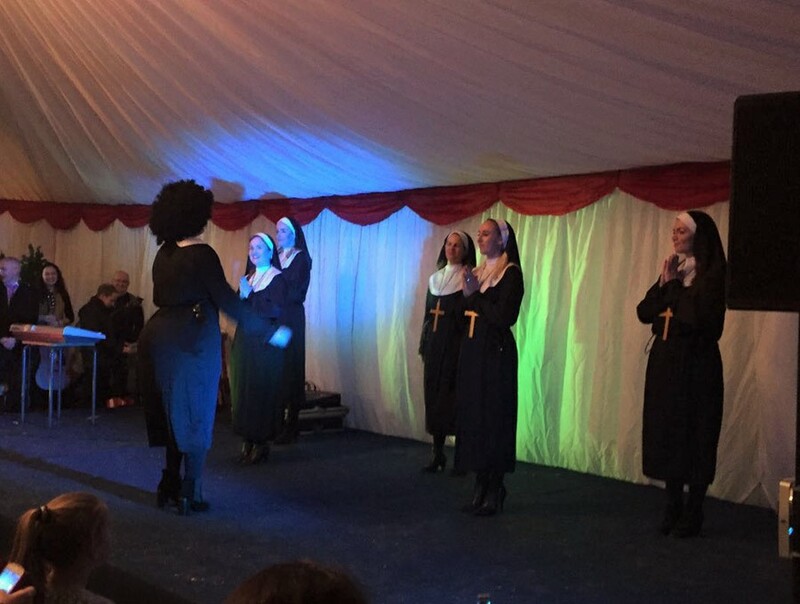 The female teacher group were up next performing their Sister Act with a twist act. 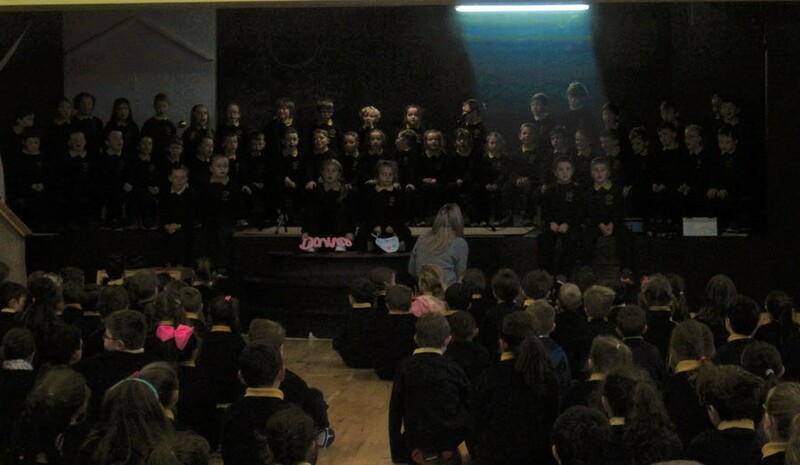 With Ms. Fitzpatrick leading the ‘nuns’ in hymn, this routine went down a storm as expected. Sinead Browne and Bobby Fahy were up next and added a touch of class and talent to proceedings. This touch of class and talent was shattered by the male teachers as Mr. Boombastic and the Beastly Boys put on a dancing performance that was either genius, pure bonkers or a bit of both! There are plenty of videos of the event going around so we will let you decide. 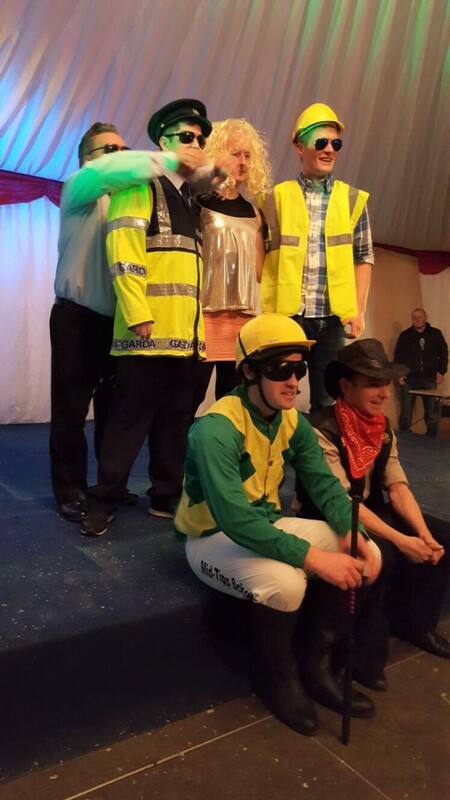 The school would like to thank everyone for the effort put in on the night, especially our MC Martin Meade. Thanks to everyone for attending and helping us to fund the money needed to fix the roof in the old part of the school. This night will live long in the memory. Craft Club: the girls and boys in Ms. Atkinson’s after school craft club have been creating some excellent craft pieces recently. 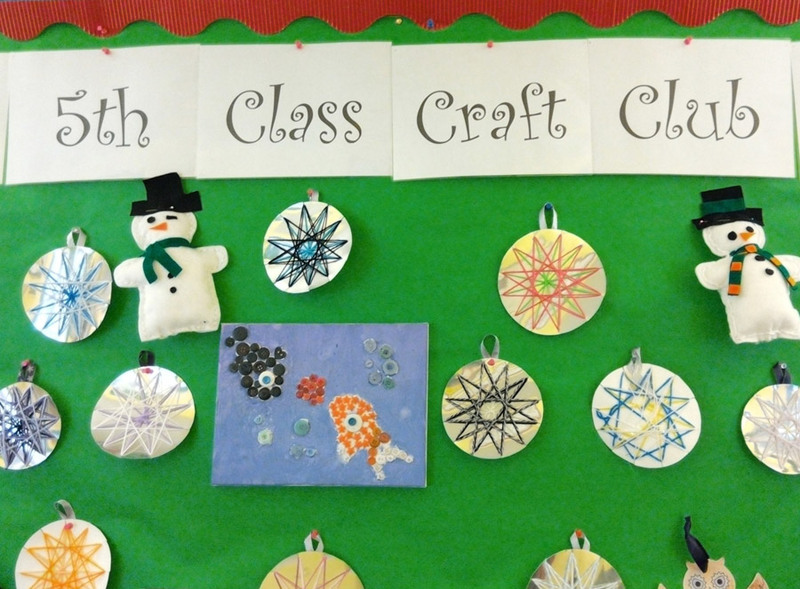 The craft club is on every Tuesday after school from 3:00 – 4:00 for 5th class children and will be resuming once again after the Christmas break. 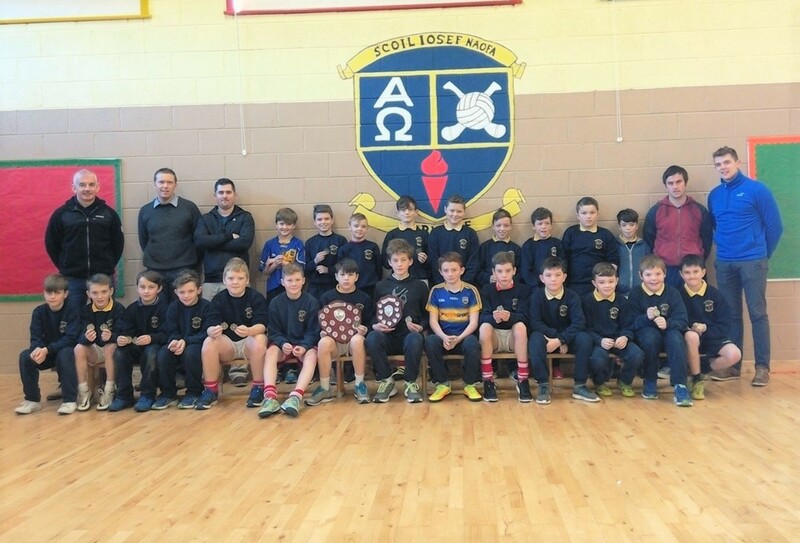 Medal Presentation: Ronan Maher from the All Ireland winning Tipp team was in school last week to present our hugely successful football teams with their county medals. 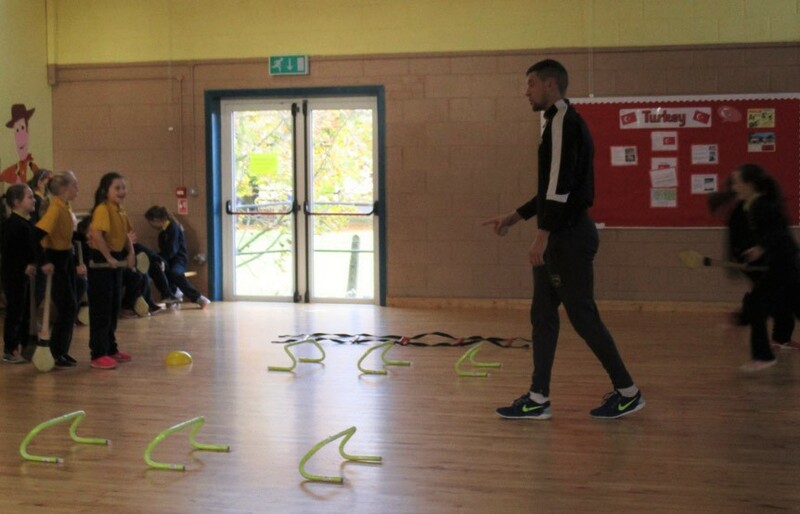 All the children were very excited to have Ronan in the school and we hope Ronan’s words of encouragement to all our boys and girls lead to continued success in the future. Everyone that won a medal for the school should be very proud of your achievements. It’s not every day you win a county medal so cherish it! 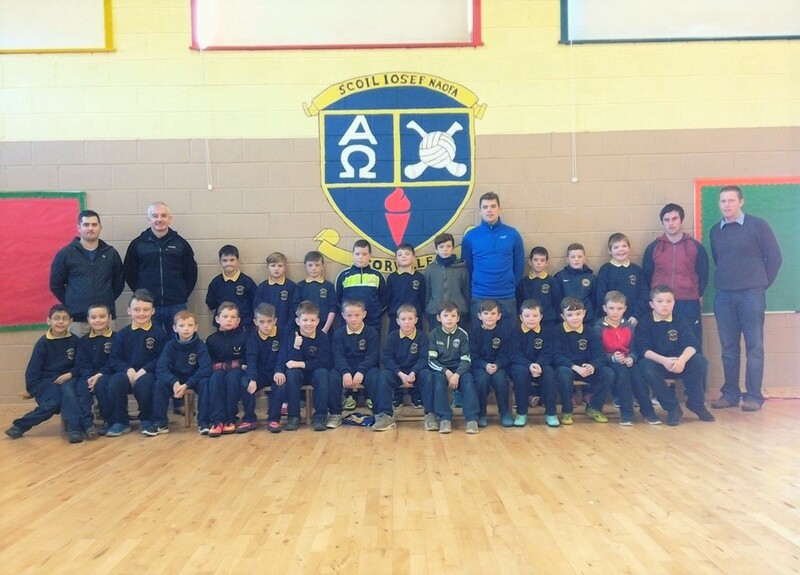 3rd / 4th Class FAI Boy’s Soccer Blitz: Corville sent an A and B team down to this 5 a-side futsal blitz in Thurles. Both teams have been training very hard and are playing some quality football. This was a non competitive competition with no prizes to be won but it gave our lads a great opportunity to gain experience representing the school. The fact that both teams performed very well on the day was an added bonus. 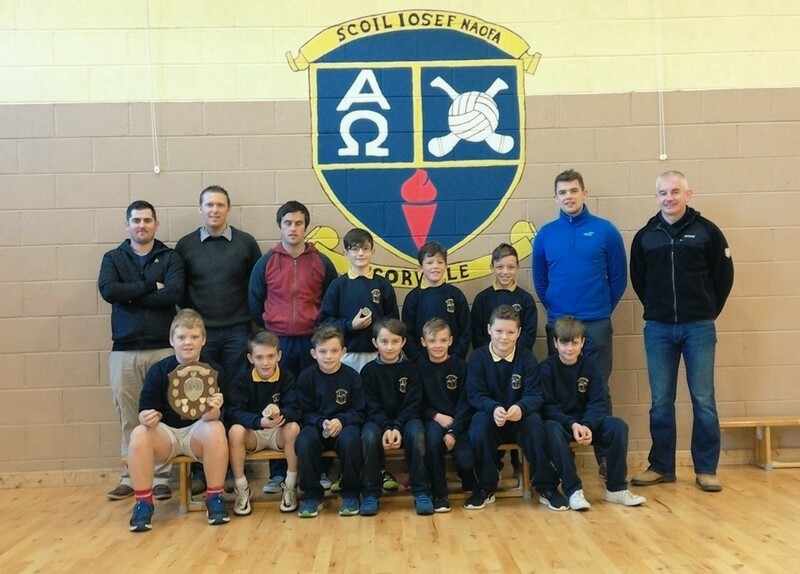 The A team consisted of Sam Dooley, Seán Purcell, Billy Hayes, Patrick Maloney, Miko Pasilic and Josh Loughnane. This team were unbeaten after 4 matches and topped the table. 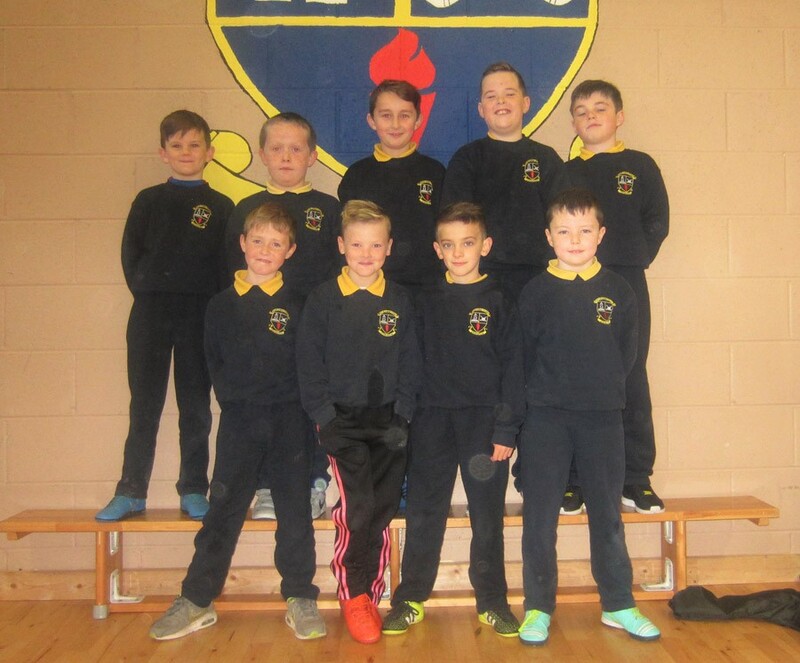 Our B team consisted of Ryan O’Meara, Harry Loughnane, Cathal McDonald, Declan Walsh, Daniel Purcell, Brody Lee, Bobby Lynch and Seán Nolan. This was a very young team but they played well, winning two matches and just losing one match. Things are certainly looking bright for the future. 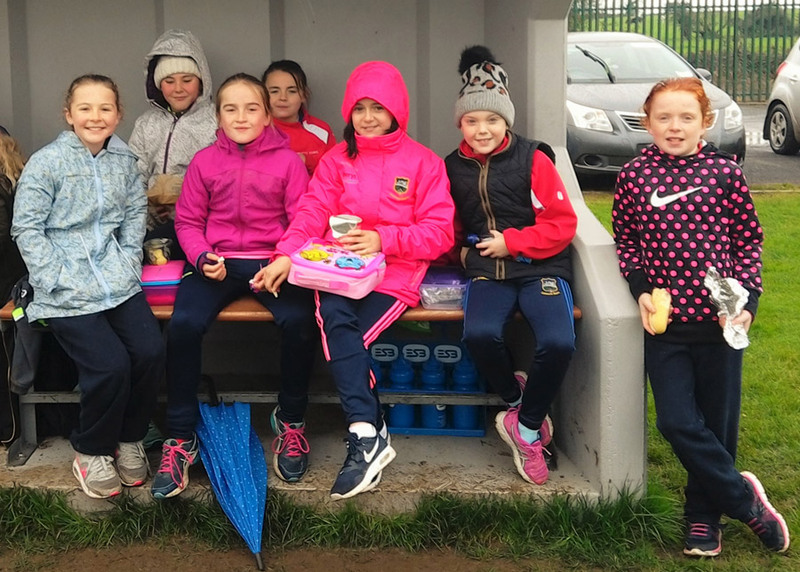 3rd / 4th Class FAI Girl’s Soccer Blitz: was cancelled due to freezing weather on the day and will be re-arranged for another time in January. Training after school: all football and soccer training after school has come to an end. Hurling, soccer and athletics training will resume once we return after Christmas. 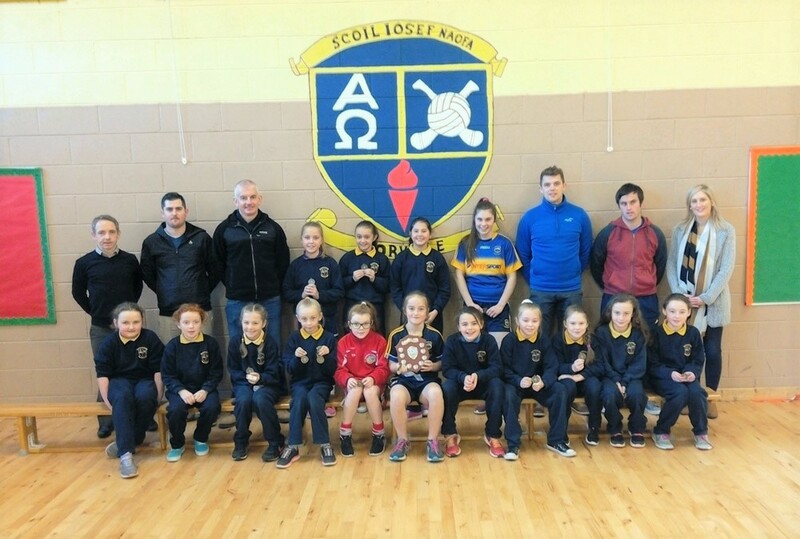 Roscrea teams: there are a wide variety of sports clubs in Roscrea that would be delighted to have Corville students on their teams. Make sure to sign up and play for these teams. They will help you stay fit and improve your skills and you will make plenty of new friends too. School Assembly Performances: every Friday at assembly one class level has to perform on stage in front of the whole school. This is a great way of building confidence in the children and it gets assembly off to a positive start. Below are the children from 1st Class singing ‘Can’t Stop the Feeling’ by Justin Timberlake! 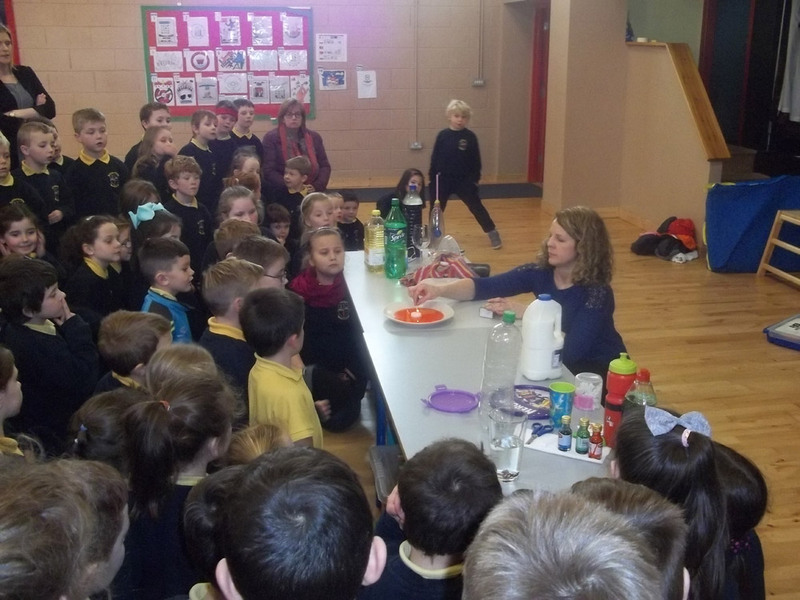 We recently celebrated science week in the school. A week full of science investigation and exploration was enjoyed by all the students. Each class engaged in different activities; for example Ms. Browne’s class experimented with placing balloons under the legs of the table and then standing on the table. Our infant classes took part in a screaming balloon experiment. 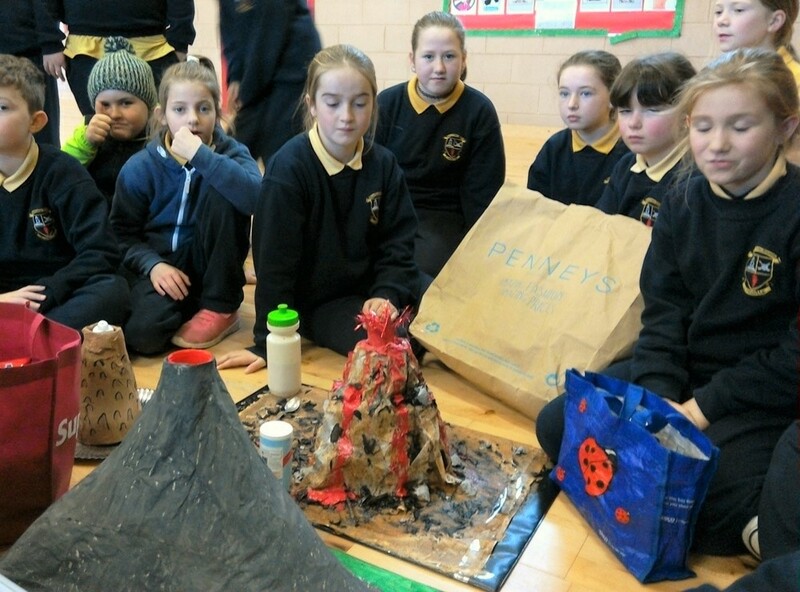 Students in Mr. Phelan’s class made their very own active volcanoes! A scientist of the week was nominated from each class so well done to our top scientists. 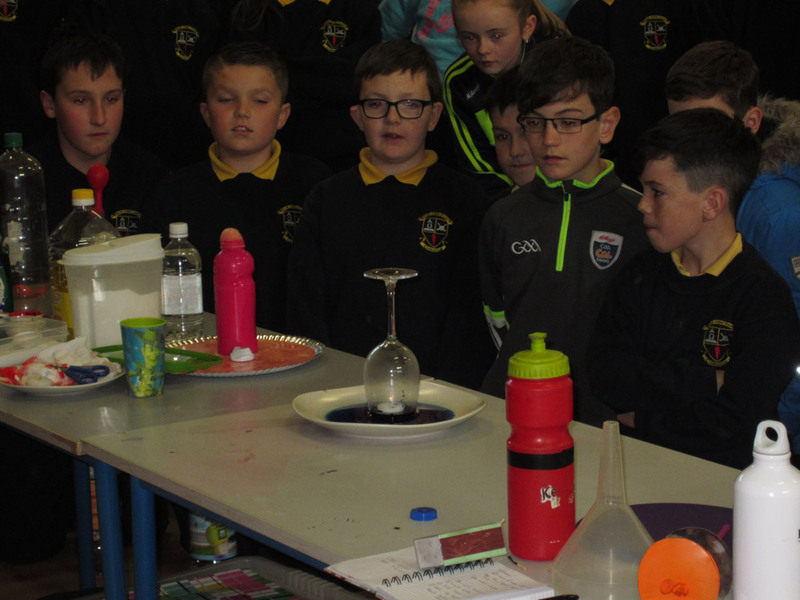 On Thursday, Ms. McManus organised a science fair in school. 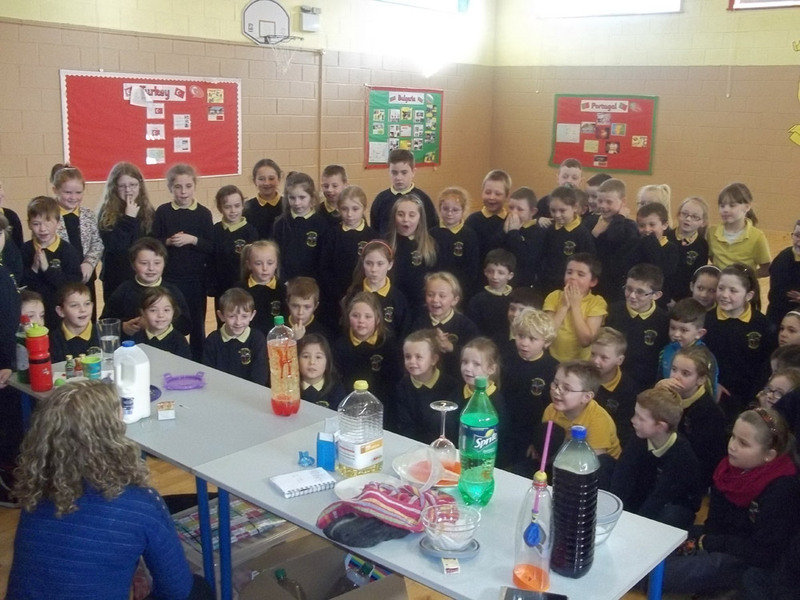 This was a huge success and the children really enjoyed all the experiments shown. 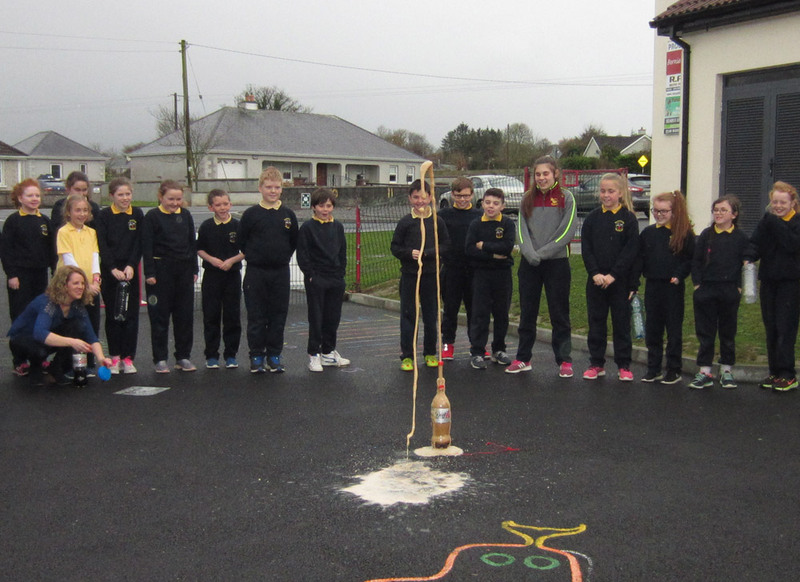 They learned all about dancing raisins, lava in a bottle, floating teabags and the explosive effect of Mentos in a bottle of coke. 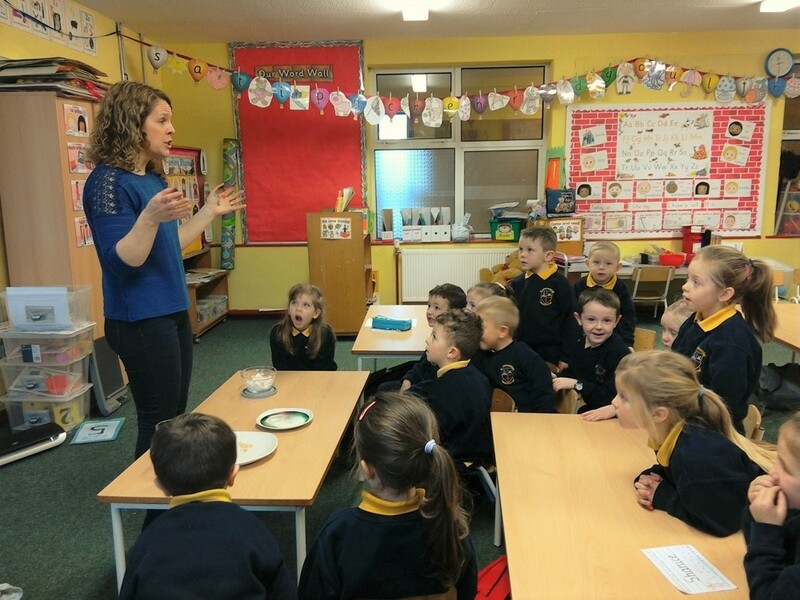 During the week every class took part in a challenge to identify the real egg or the rubber egg. They found out the answer at the fair. The ‘A Taste of Roscrea’ festival is just around the corner. Corville will be performing on Friday, December 2nd with doors open at 7:00pm. We will be putting on a show not to be missed! Tickets are on sale now from the office. All proceeds from the night go towards school repairs so please come along to watch our students and teachers perform. Full details on the poster below. The football finals have been stealing the headlines over the last few weeks but there are still plenty of other activities taking place in school at the moment. Active Flag – as all of you are aware, the school is trying to gain a blue Active Flag. 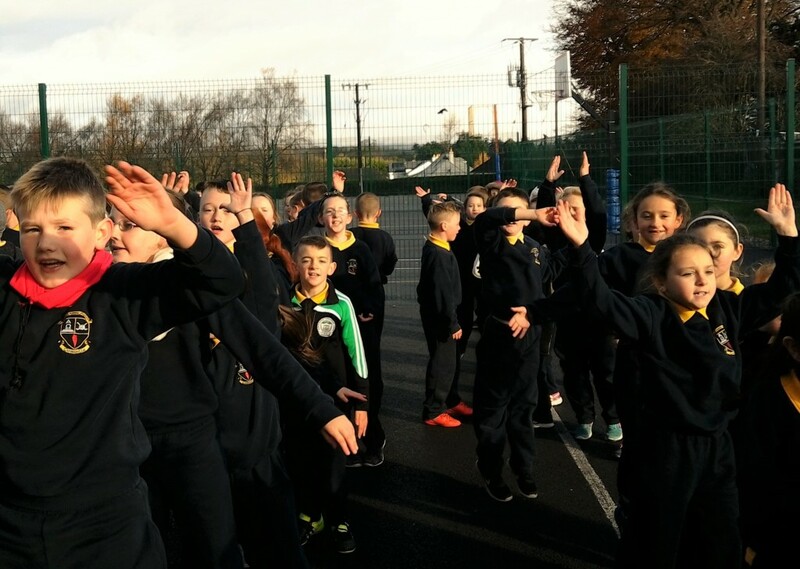 Every month the whole school are targeting a new activity to build our fitness. As our motto says ‘Let’s Get Moving!’. At the moment, we are engaging in Active Líne. When the students are lining up to go back to class after lunch they are tasked with doing exercises such as Jumping Jacks and Knee Lifts. This has been very enjoyable and is a great way of introducing more movement into our lunch breaks. In December, we will be doing our Advent Calendar of activities where each day we open a box to see what new activity we have to do for that day. The school has also started an Active Homework activity – so each evening we are exercising our bodies as well as our brains! Classroom Updates – our teachers are updating the website with the latest activities taking place in their classrooms. If you look at the bottom of this web page you will see links to the infant, middle and senior classes. 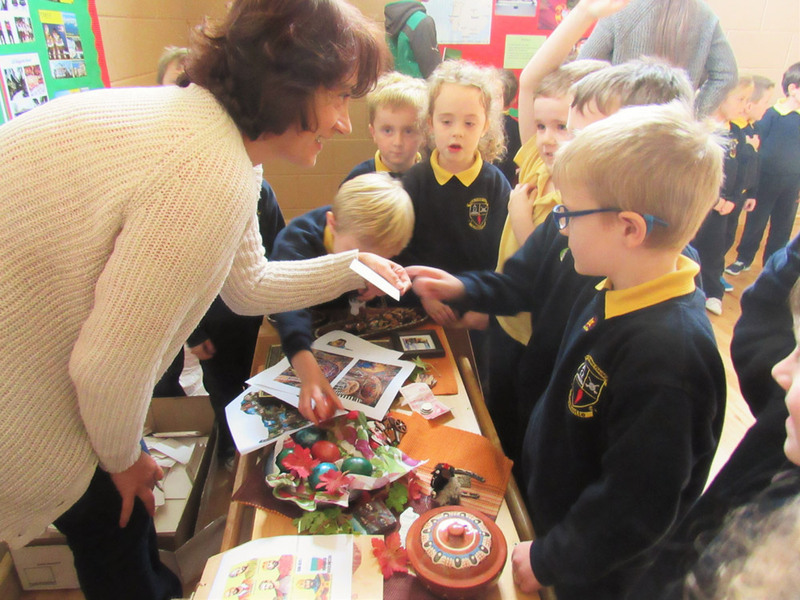 You can check out what has been happening in school. We hope to keep this updates regularly as the year progresses. Fastest on the Draw Quiz – we have a huge entry for our annual buzzer quiz. 35 teams of 3 have entered looking to be crowned champions for 2016. This quiz takes place in a knock out format. There is a 3rd/4th class competition and a 5th/6th class competition. The teams will have to battle through 4 rounds before they get to take part in the grand final in the school hall in front of the whole school just before the Christmas break. 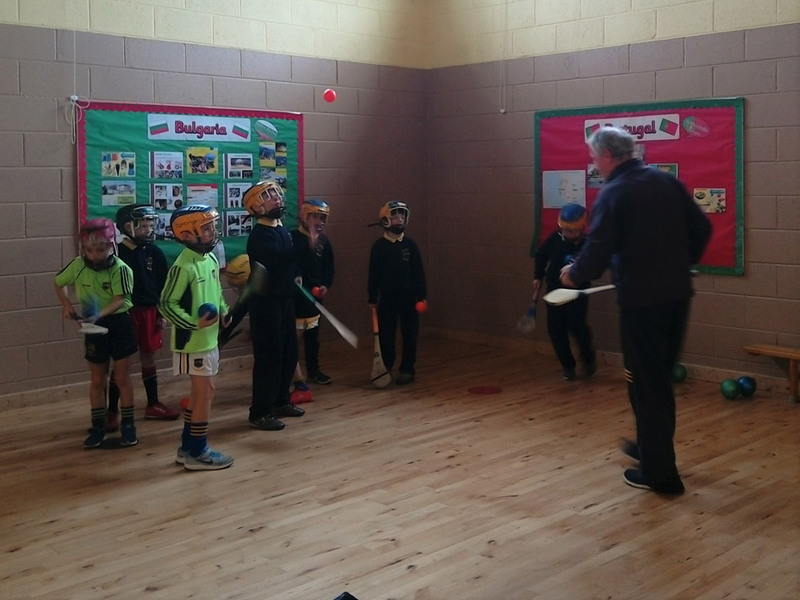 Hurling Training – it is great to see our external hurling / camogie coaches back in school to help the next generation of Tipperary superstars from Corville. The kids get great enjoyment out of these sessions and we can already see the skill levels rising quickly. 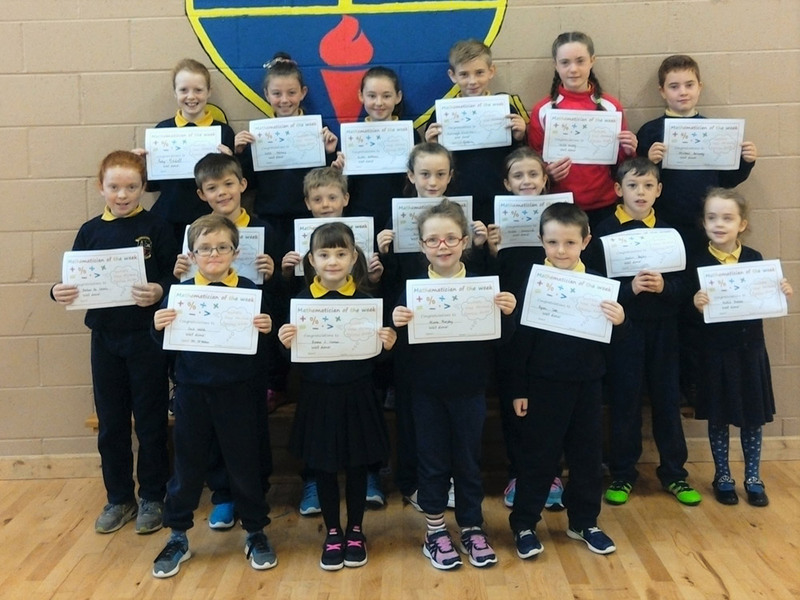 Handwriters of the Month – Each month the school recognises the great efforts put in by our students to write neatly. 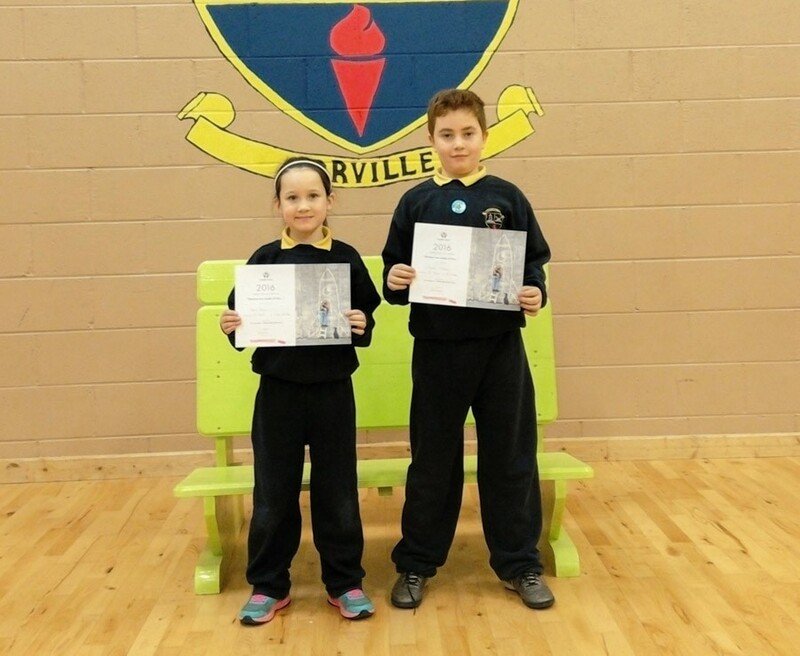 Our handwriters of the month winners for October are shown in the photo below. Each student has shown excellent penmanship with well formed letters, correct spacing, joined writing and excellent presentation just some of the qualities shown. The school’s Drive for Five unfortunately came to an end last week, but we certainly didn’t go down without a fight. 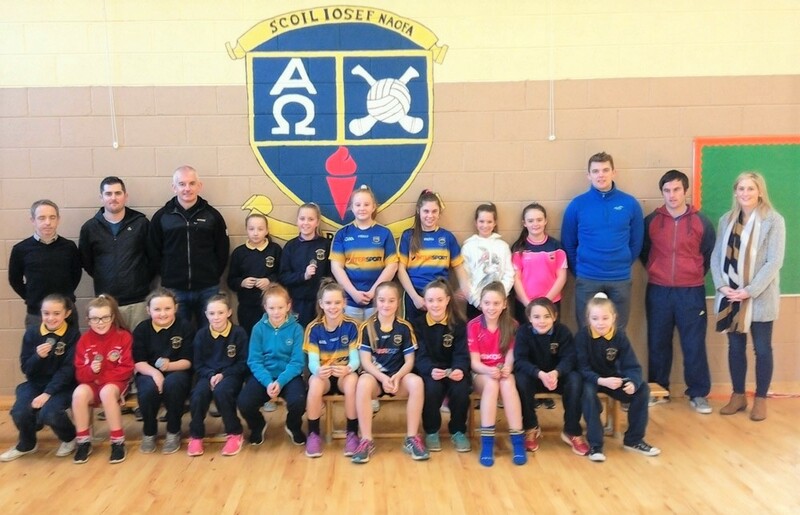 Our Boys U/11 and Girls U/13 teams were in action in Cashel last Friday. 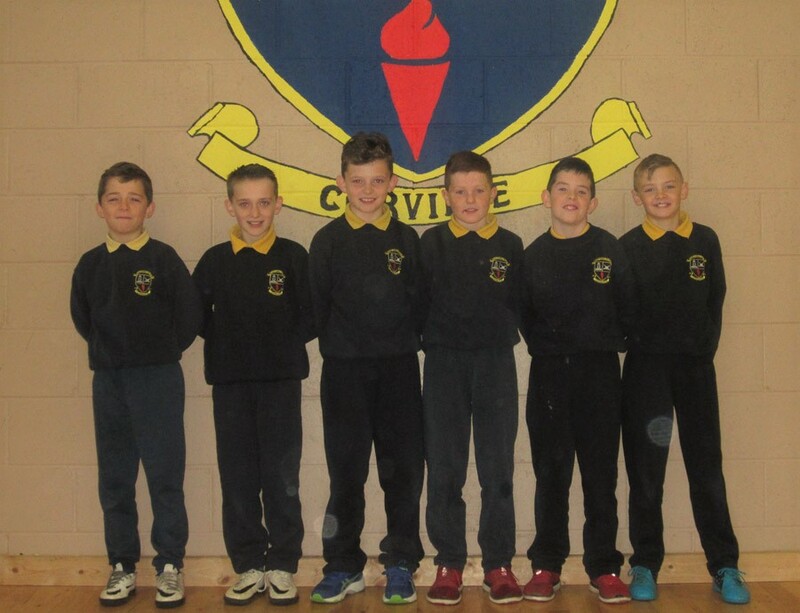 First up were the boys, captained by Matthew Bergin, and they were taking on Gaelscoil Clonmel. We have a supremely talented boys U/11 team and they showed their worth in this match. Corville were on top in each line and all the individual battles were being won. A healthy lead was built before half time and that allowed Corville to bring on all our subs. There were fine performances all over the pitch so there is no need to single any boys out for praise. This was a true team effort. 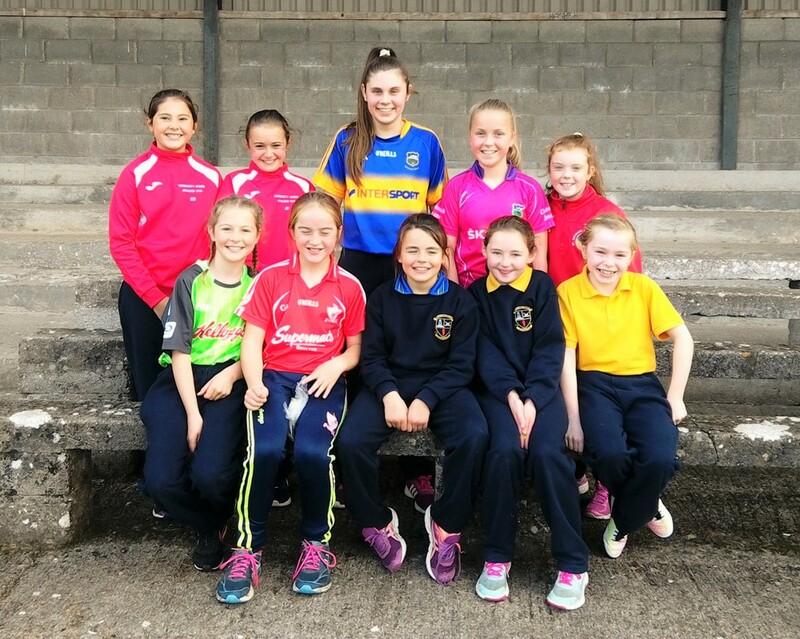 The Girls U/13 team, captained by Khya Lynch, were taking on the home team, Cashel GNS in their final. Cashel had very vocal support and they also had a fine team. 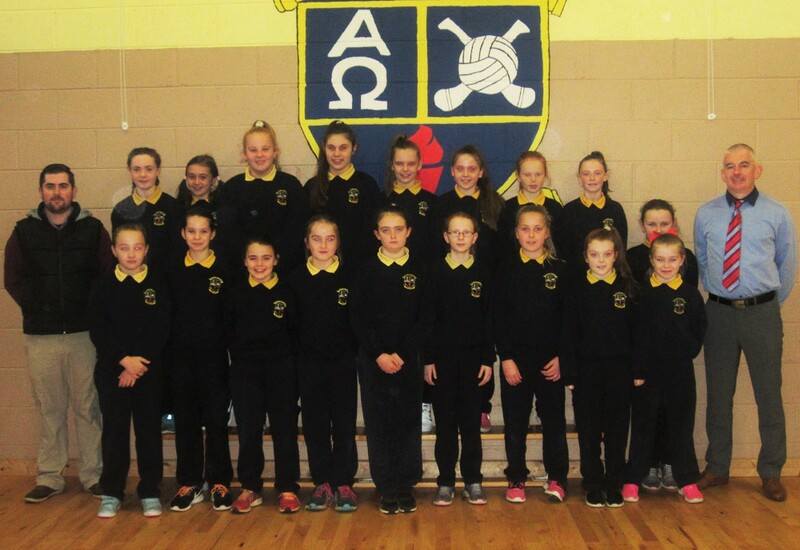 The girls lost to Cashel in last year’s camogie final so they were eager to reverse the result this time. Unfortunately for us, the girls came up against a better team on the day. There was very little between the teams at half time but Cashel were able to push on and take the win in the second half. Our girls were very disappointed at the end but that just goes to show you the passion and determination they possess. Many on this team will be back again next year to go one step further. Big congrats to both teams; everyone in the school is hugely proud of all your fine efforts this year. County U/13 Boys & U/11 Girls Champions! The first two football finals in our ‘Drive for Five’ took place today and both matches could not have gone any better. The skill levels, determination and sheer class shown by our girls and boys was a joy to behold. In what was a horrible day for football, our teams managed to serve up some outstanding play. There wasn’t one poor performance all over the pitch. There was huge self belief and confidence in our teams and from the moment the ball was thrown in the players battled tigerishly to claim convincing wins in both matches. U/13 Boys: Alex Morrisey put in a real captain’s performance today as he led his team to victory over a Lisnamrock team that had some fine players in their side. There was a Titanic struggle between the two teams for most of the match but Corville were finding it a little easier to pick off their scores. Devin Loughnane was giving his defender a torrid time up front and with Ryan Thompson putting in some exquisite through balls, the team soon built up a decent lead. The defence were very strong with Cian Carey, Leigh Loughnane and Sean Purcell letting very little past them. Matthew Bergin pulled off some fine saves in goal at important times. 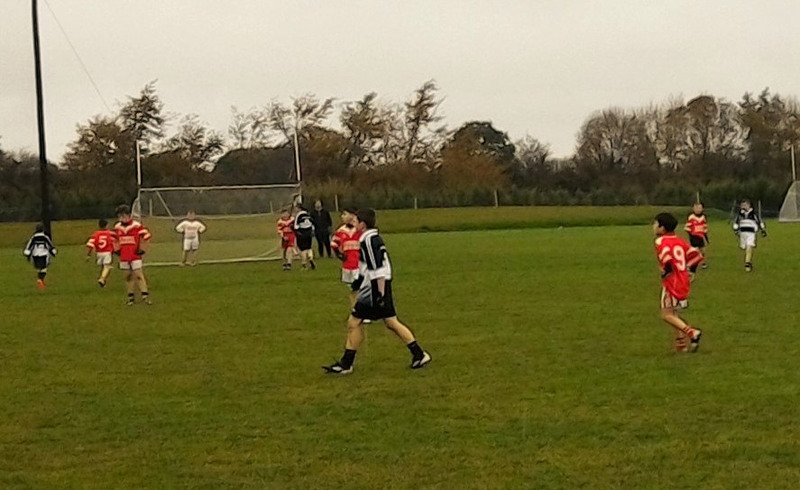 There was strong performances from Brian O’Rourke, David Feehan, Patrick Maloney and Aaron Mulready too. This victory was built on solid and consistent training in Corville each and every week. Be very proud of your efforts today and over the last two months. 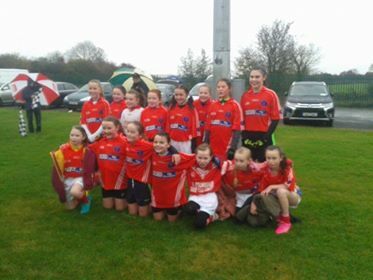 U/11 Girls: this was the girl’s first taste of a county final and they certainly didn’t let the occasion get the better of them. The girls were well up for it and were coming out on top all over the pitch against quality opposition in Donaskeigh. It was a real team effort today and the amount of running done was phenomenal. Ceola and Abi gained control of the midfield early on and kept the pressure on all match. Up front Ava Baranya Nash was on fire and was too hot to handle on this occasion for the Donaskeigh defence. Niamh O’Brien and Sarah O’Toole seemed to be first to every ball that came their way in defence. Tori was as solid and dependable as ever in goals. A large lead was built and that enabled Corville to completely change the team in the second half by bringing on all our subs for some vital county final experience. The young girls that came on battled heroically and more than held their own. This experience will stand to them in next year’s competition. It’s a great feeling to get to a County Final; it’s an even better feeling winning one. Remember what it feels like boys and girls because we want to keep coming back here in the future. For now, we need to keep our feet firmly on the ground as we have two more huge matches coming up at the end of the week. 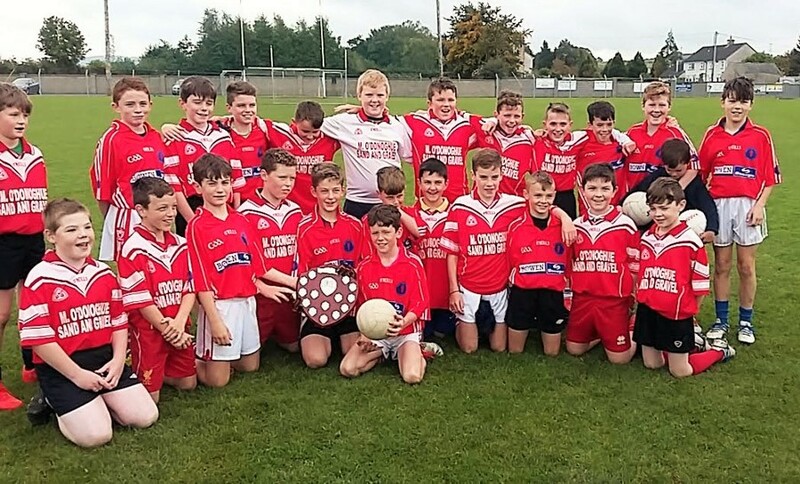 On Friday, our U/13 Girls are first up in their County Final; straight after them, it’s the U/11 Boys County Final. Best of luck to both teams. 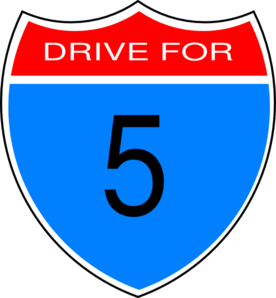 Corville’s very own ‘Drive for Five’ gets underway this week. We have been given dates and times for four of the county football finals. We are not sure just yet when the U/11 B final blitz will take place. All supporters are welcome to come cheer on the teams in Littleton on Tuesday and Cashel on Friday. The new school year has got off to an absolute flyer. I can’t for the life of me remember a time when so many amazing thing were happening in the school. We started off with excellent county cross country results; we surpassed that achievement by qualifying all 5 of our football teams for county finals. 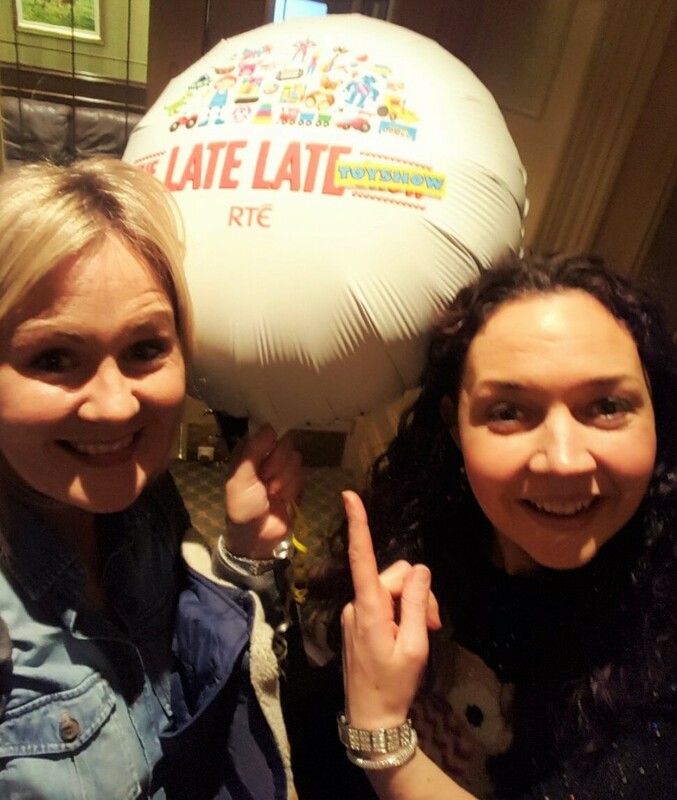 Our choir were truly inspiring too by qualifying for The Late Late Toy Show auditions with Ryan Tubridy down in Cork. Not only all that, we had the superstar that is Katie Taylor down for a visit. We are finding it hard to catch our breath with all the things going on! I think we can all do with a relaxing Halloween break to recharge the batteries. 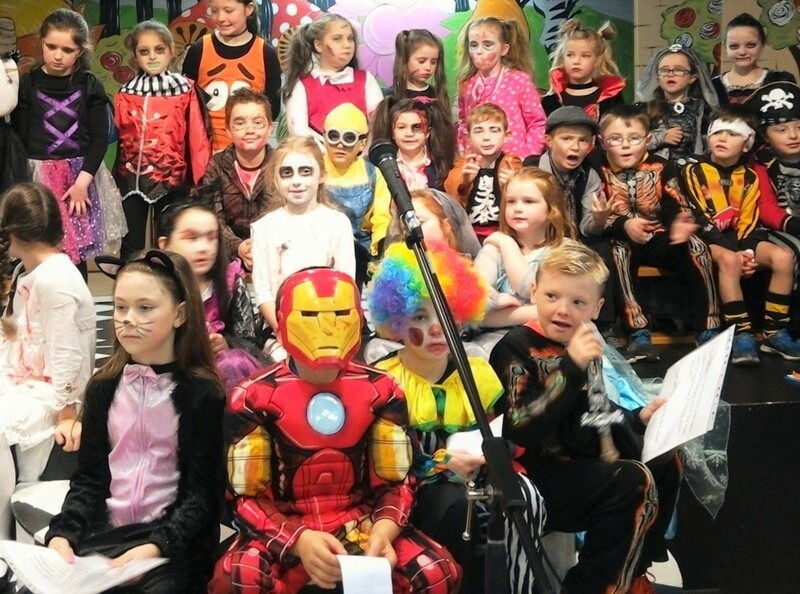 The final day before the break saw the children and teachers dress up in their Halloween costumes. 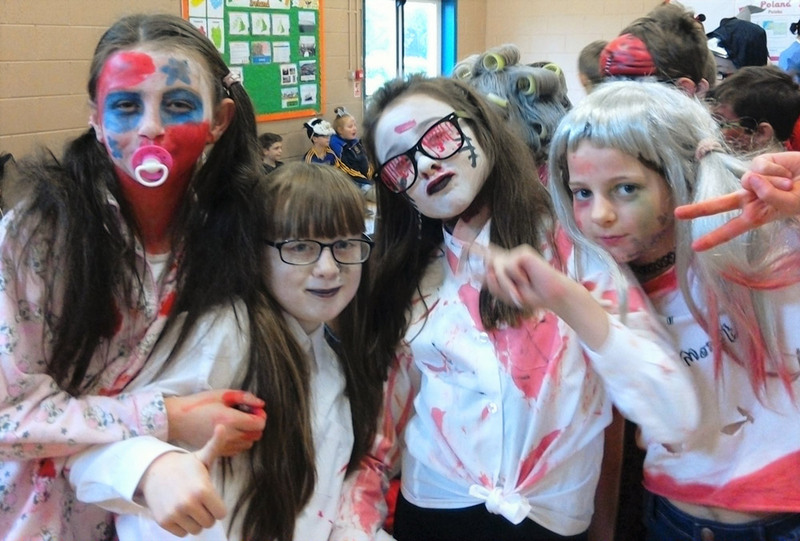 We had witches, werewolves, skeletons, vampires, zombies, wizards, ghosts, minions and even a jockey in attendance! A great final day was had by all. After we return, attention will immediately turn to our very own ‘Drive for Five’. We will see if our footballers can bring some silverware back to the school. After that we have a new FAI 3rd/4th class girls and boys soccer competition. Our schoolwide quiz competition ‘Fastest on the Draw’ will commence. Then it’s all hands to the pump to get ready for the annual school play. This year’s play promises to be bigger and better than ever. We will reveal full details next month. Enjoy the break and we will see you all again on Monday, November 7th. 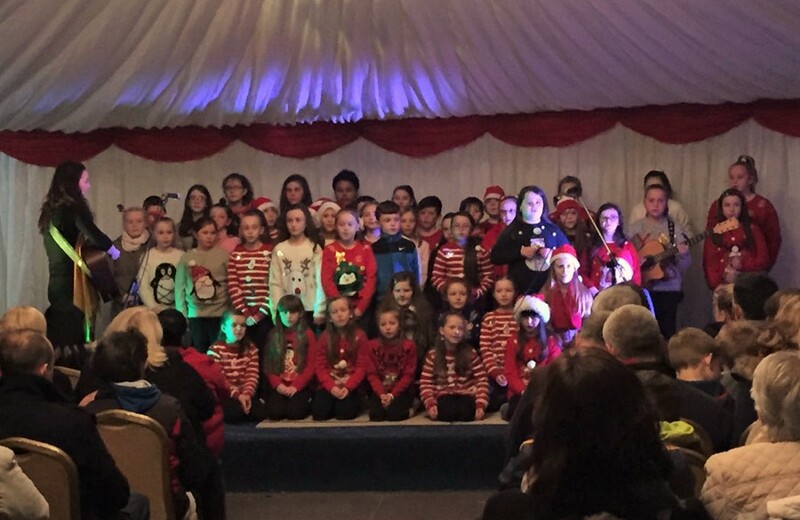 The Corville School Choir are on the up and up, and could be set to hit the BIG TIME, having received the FANTASTIC news that our Toy Show entry made it to the final round of auditions!! Our audition took place in Cork last Monday, 24th October. The 59 strong choir hit the road “on tour” and it turned out to be one of the most exciting trips we have ever had the pleasure of making. 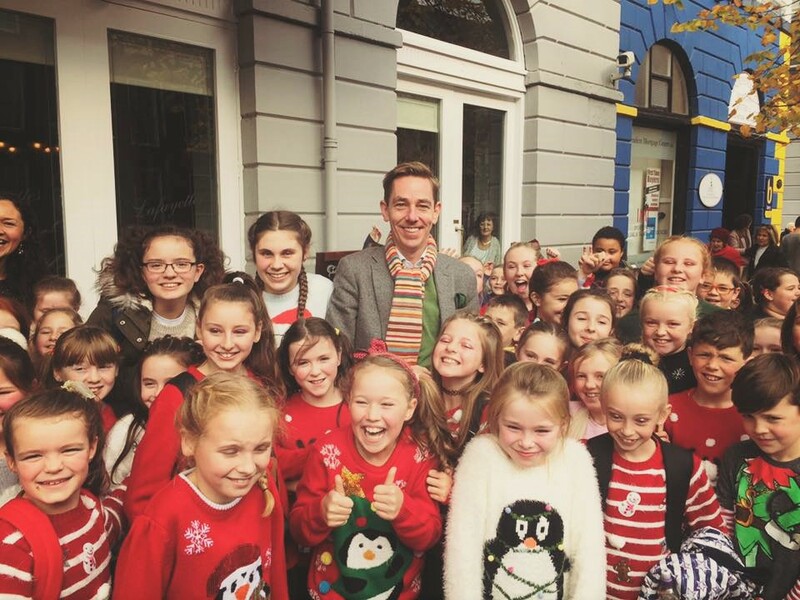 We had no sooner arrived in Cork off the bus, when we ran straight into the man himself, Ryan Tubridy, who took time out of his hectic schedule to meet, greet and high five the kids of Corville. Our audition went really well, so well done to all the children and teachers involved! The audition was recorded and filmed and the RTE team also spent plenty of time conducting interviews with us to possibly use as segments on the show. We will know in two weeks if we are lucky enough to have secured a spot to perform on the show itself, so fingers crossed. But either way it was an amazing experience, and one both the teachers and children will never forget! It’s not every day your school has a true global superstar walking through its doors. 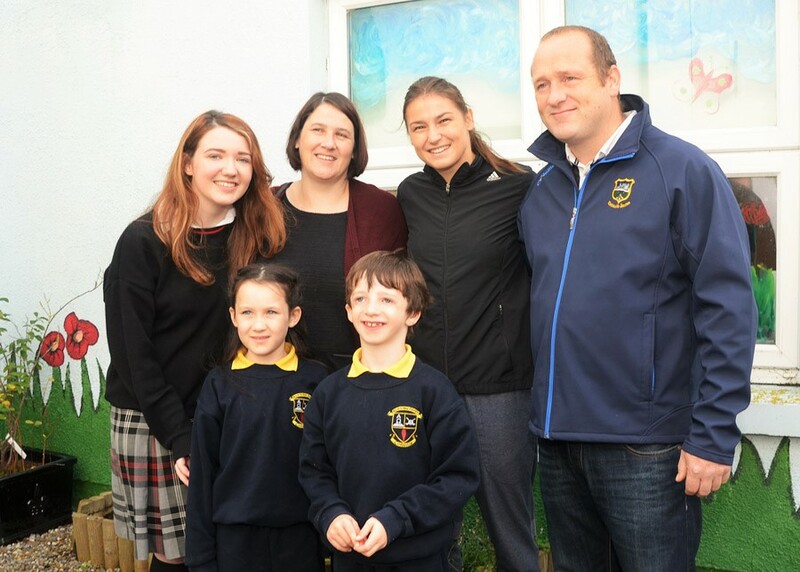 Understandably, everyone in the school was really excited at having Katie Taylor join us for the day. 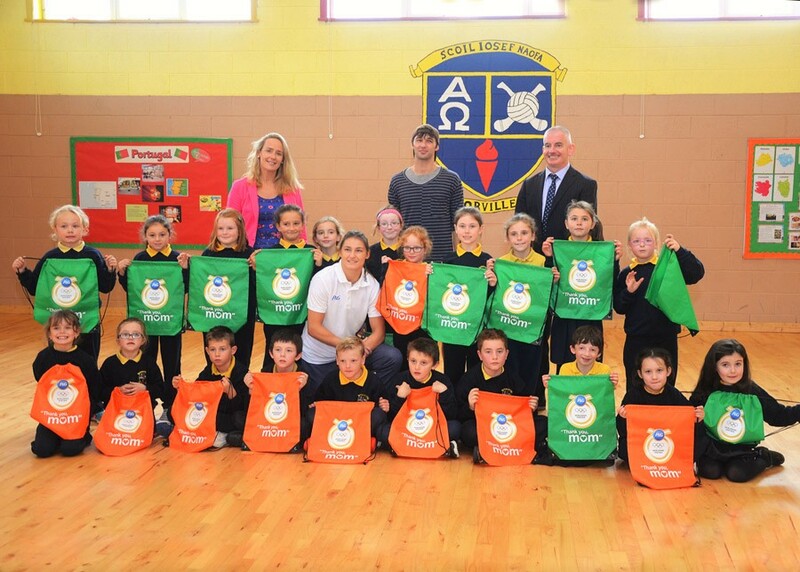 Katie came to visit 2nd class student Jack Ryan who won the P&G Olympics competition, in association with Supervalu, offering schools and clubs nationwide the opportunity to win a once in a lifetime prize, a training session with the multiple World and Olympic champion. Katie was given a guard of honour into the school. She met with Jack, his twin sister Amy and their family and then proceeded to the school hall to meet the rest of the school. Katie gave a lovely speech and encouraged all our students to believe in themselves. With 5 county football final appearances coming up soon we need plenty of that self belief! Katie and her brother then took Jack and the rest of his class out for a private training session. This was an amazing experience for all those boys and girls. During the visit Katie spoke of Jack’s unbelievable courage and positive outlook on life. Katie acknowledged the tremendous work done by Jack’s parents Enda and Linda and also the school community. Katie also remarked on the wonderful sports facilities that Corville has to offer the present and future children of Roscrea. Mr. Slattery thanked Katie for an unforgettable day that will live long in the memories of every child and adult present. ‘Katie is an inspiration to our community and she is a credit to her own mum’. Katie left the school, leaving behind big dreams for the boys and girls to achieve and several sets of signed boxing gloves that will be raffled by the school during the year. This day will certainly live long in the memory! 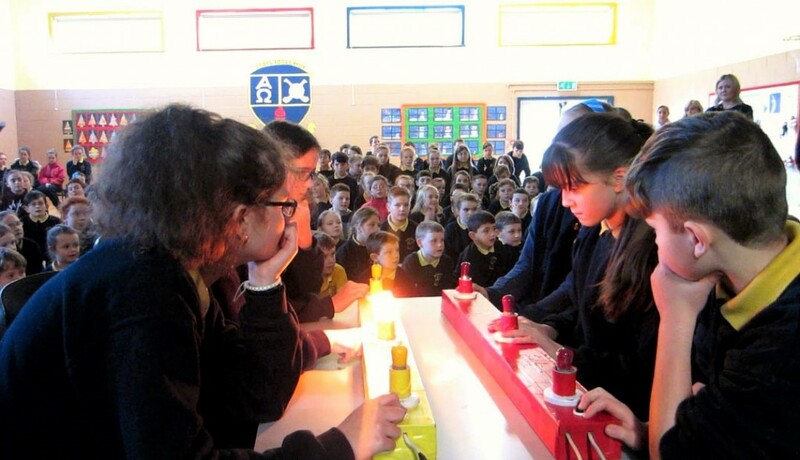 For the last 5 weeks the school has been running our annual ‘Battle of the Brains’ quiz competition. 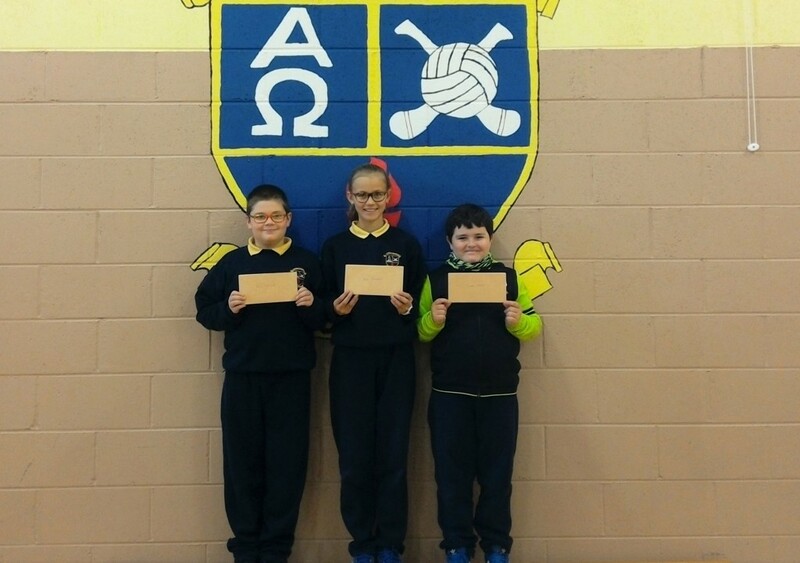 This competition was open to students from 4th to 6th class. 30 questions were answered individually each week and each student’s score was totalled and put into a league table. After 5 weeks of battle, we now have our winners! Our future quiz squad has been selected from the top 16 in this competition. The members of this squad will compete for a place on our Credit Union Quiz team in January. As an extra reward for winning, Keri will captain our U/13 team while Senan will captain our U/11 team. It is a very good achievement to make the squad so be proud of your efforts over the last few weeks. This football season is already proving to be our most successful season to date. Take a bow all the students, parents and teachers involved in making this happen. All 4 of our football teams have managed to make it to the county final. 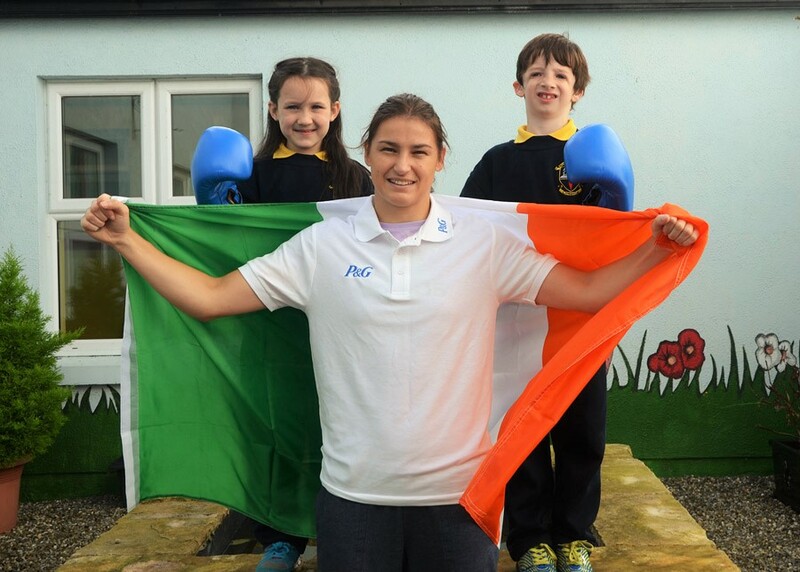 Our students have clearly taken the inspiring message from Katie Taylor, during her recent school visit, to heart. They are certainly showing that ‘they are born for greatness’ on the football pitch. 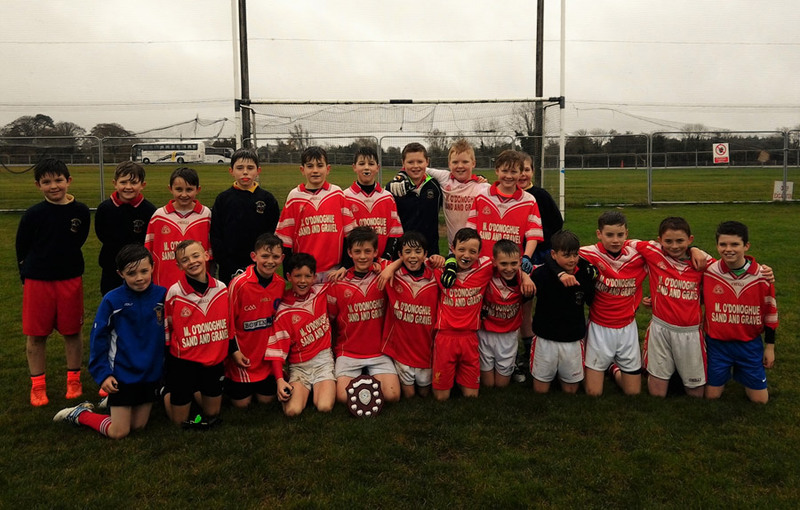 The last team through to the 2016 county finals were our U/11 boys. They won their qualifying blitz today down in Drombane, beating Upperchurch and Thomastown to progress. Out of the 12 football matches our teams have played this year, we have won all of them. It is going to be a very exciting few weeks in the school as we wait for the County Final. No details as to where and when the finals will be on have been issued yet. Our focus will be to train hard, support each other and make sure we are well prepared to represent the Corville and Roscrea community in the finals. The school made it 3 out of 3 teams through to the football county finals. We are one step closer to achieving the unprecedented feat of qualifying all 4 underage teams for the county football finals. The girls were up against Birdhill today in the county semi final. Birdhill were a very tough opposition but our girls found a way to beat them. When the going got tough, our girls got going. Superior scoring power in the form of Lucy Lee, Khya Lynch and Ceola Bergin was the main difference on the day. The slippery conditions made handling the ball tough but our girls still managed to show a lot of class in attack and resilience in defence. As of yet we have no dates for the final. Fingers crossed we get to bring our 3 teams to Semple Stadium and with the U/11 Boys in action tomorrow it would be no surprise if we were bringing 4! Best of luck tomorrow boys! The school has made it two out of two in our pursuit of making it to 4 county football finals this year. Our U/13 boys put in a superb performance against a strong Moyglass team to join our U/11 girl’s team in the county finals. Playing into a strong breeze in the first half, Corville battled well to keep the scores even at half time. With the wind at our backs in the 2nd half, the boys were able to kick on and record an 8 point win. The fitness levels shown and the willingness to put in the hard work was outstanding. It will take a good team to beat these lads in the final. Next up: our U/13 girls play their county semi final against Birdhill in Nenagh tomorrow at 11:00. This is followed by the U/11 boys blitz the following day. 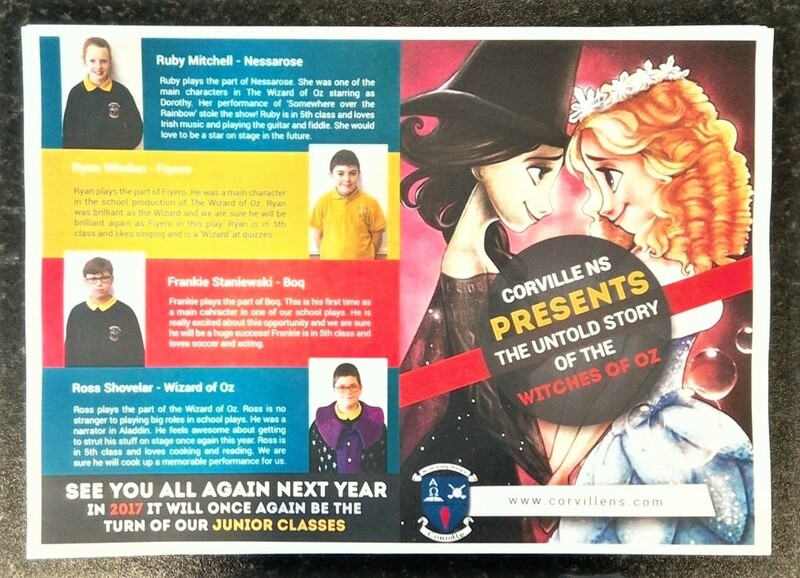 Exciting times at Corville NS! It has been a terrific start to the year for our football teams. Last week our U/13 boys were crowned North Champions and now, in a first for the school, our U/11 girls have made it through to the County Final. This is a huge achievement for the girls and the school. It reflects the commitment all the girls are showing in training. We are very proud of their efforts. The girls won their blitz in fine style and will be in with a good chance of victory in the final. Hopefully we get to play the final in Semple Stadium but no dates or venue has been selected yet. We will inform you all when we get further details. With both the boys and girls U/13 teams through to the County Semi Finals and a strong U/11 boy’s team starting their first blitz next week, the possibility of having 4 teams in County Finals is possible. We are very lucky to be taking part in an Erasmus+ project this year! 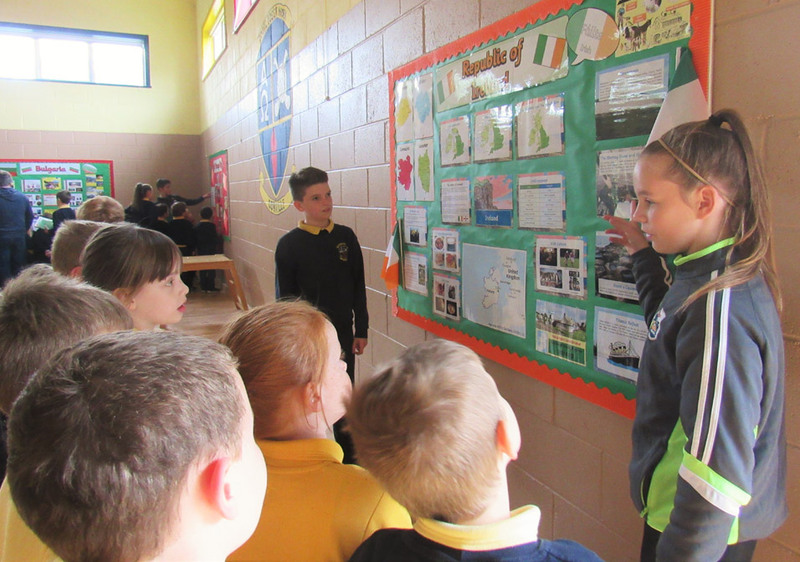 We are the coordinating school in Ireland and are linked with four other schools around Europe .We will be travelling to each of the four countries; Poland, Turkey, Bulgaria and Portugal. We will also have lots of visitors from these countries visiting us in Roscrea. Our project is about industry. The title is “The Work of Our Hands, Yesterday, Today and Tomorrow of European Industry.” We will be learning about industry in our country – especially the use and manufacture of wool. We had a launch day in the hall last week. Students from the school talked about the different countries involved. We all learned many things about these countries. Here are the winners from our Erasmus logo design competition, plus some photos from our launch day. Thanks to all the students who helped out on the day. 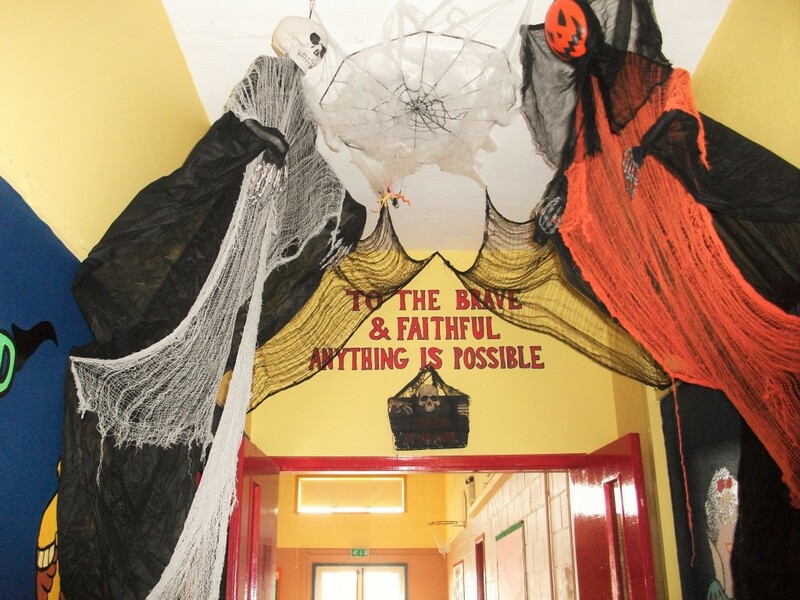 The school is looking very spooky at the moment. 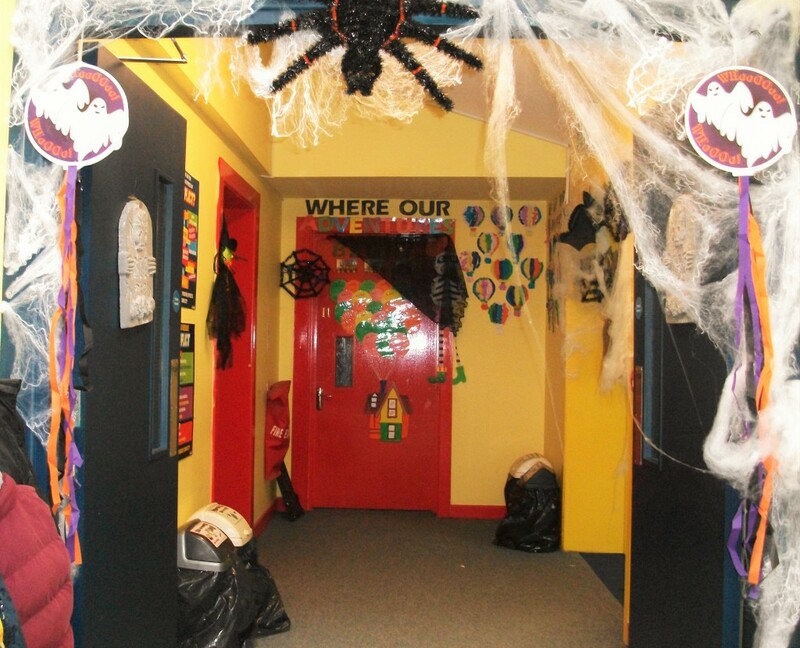 If you’re not looking where you’re going you might end up in a spider’s web or a zombie’s lair! 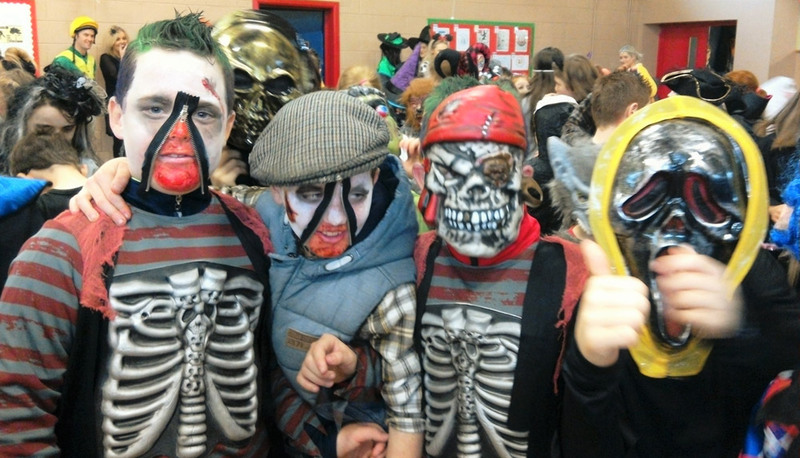 We hope everyone is as excited about Halloween as we are in the school. 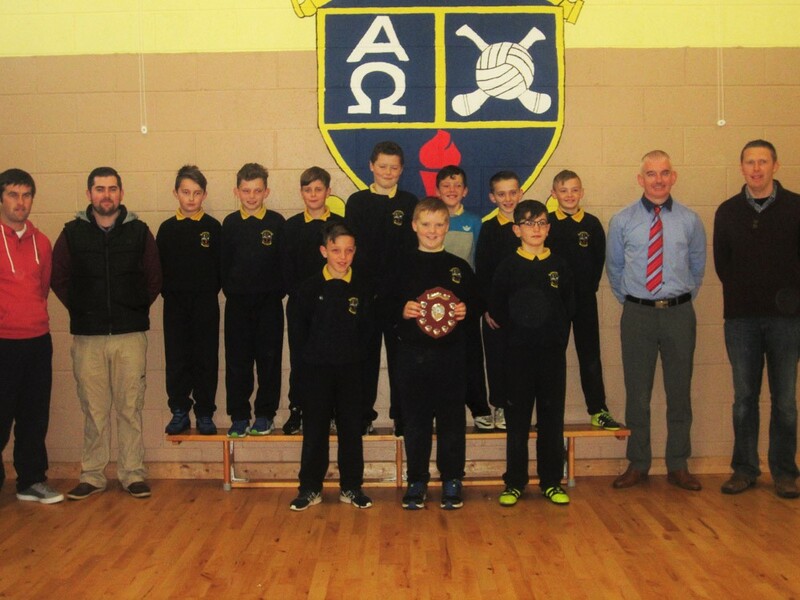 Congratulations to the Boys U/13 football team for winning the North Final on Friday. The boys were up against a tough Ardcroney team in Toomevara but they were determined to come home the victors and that they did. There were strong performances throughout the team and this enabled the lads to build a sizeable half-time lead. Most of our subs got valuable time on the pitch and this team effort led to a comfortable win in the end. The team now progress into the county semi-finals where they will face stiff opposition from the south of the county. Best of luck to the boys’ next time out! Each month the school recognises the great efforts put in by our students to write neatly. Our handwriters of the month winners for September are shown in the photo below. Each student has shown excellent penmanship with well formed letters, correct spacing, joined writing and excellent presentation just some of the qualities shown.